Instructional methods for the art of dry fly fishing for trout are becoming a thing of the past for most anglers taking up the sport in recent years. The important tasks to develop will be highlighted in bold for the following few paragraphs. Generation differences are in large part of the puzzle as well as waters that offer freshly stocked fish for the masses to have successes in short order. Private waters and delayed harvest streams fall into this category in this part of the country. Most fly anglers that I knew growing up in southern Appalachia in the 1970’s and 1980’s were die-hard about using attractor patterns for trout or flies that matched specific hatches. Most of the time these anglers would use only dry flies for their time spent on the stream. I am not advocating always fishing dries on the stream but I do think fly fishers should become adept at perfecting their dry fly game for a richer experience of the sport overall. At some point in the mid-1990’s, is when it was quite obvious that interest from the masses in regards to dry fly fishing was beginning to wane. When the water type and timing of hatches offer you this window of excellent opportunity it needs to be capitalized on right then. View the hatches from the hatch report here for the Great Smoky Mountains region or click green link below. Learning to achieve a drift in dry fly fishing is key for achieving success on the stream. Make it a goal for achieving long drifts. I would suggest line control is one of the biggest problems folks face attempting to increase their float times (drift) on the stream. You have to implement what is needed with line control well before it is actually needed for this to occur. This implies developing your water reading skill set which is best learned in the stream. Line control is also broken down into active and passive presentations on the stream. These fly casting terms can be found by clicking here. We often dance the dry fly with a skate, skitter, or hop to emulate the natural insects (active presentations). These are best used for erratic insect behaviors such as when caddis and stoneflies are on the water. 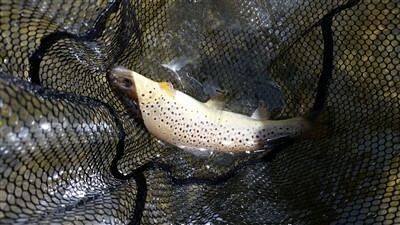 The passive presentations imply a drag free drift as a goal which often is associated with mayflies when trout fishing. Especially for spent spinners of mayflies. The cast itself needs to be honed for dealing with the surroundings on the streams. This means learning to become well versed with the change of direction casts (single handed Spey). These are matched to the dynamic currents where the trout actually are holding. To do this in its purest form means that you should master curve and pile casts for all casting planes! Hopefully, this short piece helps to lay down some goals for your pursuit of dry fly fishing! We offer private wade trips for learning this on the stream which is no doubt one of the quickest methods for your improvement. It is still one of my favorite methods of all that exist when trout fishing!